The sisters Saint-Claire are five adorable French mice, who live with their parents Odette and Pierre. Every Sunday, the family heads off to the market — except for the youngest sister, Cecile, who stays at home baking treats to keep the family well fed. Until one day Cecile decides she would like to go to the market too and sell her yummy pies. The rest of the sisters aren't keen. Cecile is so small, says Harriet. She'll get lost in the crowd, says Violet. But Cecile's parents have faith in her and realise that Cecile is no longer a baby. It's time for her to experience life beyond the front door. Cecile's Gourmet Pies is soon set up for business. But nobody believes little Cecile baked the pies herself, nobody takes her seriously. It's nearly the end of market day and Cecile hasn't sold a single pie. But is there someone who could save the day? This is a delightful story told in whimsical rhyme and illustrations that are as delectable as Cecile's pies. I particularly loved the pages showing all the market stalls — from the cleverly named Cam 'n' Berts cheese shop to the oh-so-tempting Miss Must-Have-It's stand. 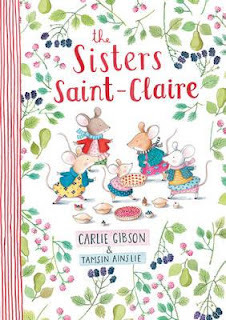 Perfect for fans of the 'Ruby Red Shoes' series (and in the same smaller format as those books), this is a little picture book with a big heart.